Beautiful estate in the winelands .... ideal starting point for golfers! Lemon Tree is a cozy 60 m2 cottage, designed over multiple levels with a 15 m2 patio area. The traditional Cape Dutch thatch creates a quaint and nostalgic charm. It offers utmost privacy on the main estate with a lovely sunny back patio and surrounded by the botanical garden. It is ideally suited to honeymooners, couples and mid-term travelers. De Kraal Estate is located in one of the most beautiful valleys in the heart of the famous wine region of the Western Cape. Stellenbosch Mountains, close to the famous Boschendal Wine Estate and just 10 minutes drive from Stellenbosch, a well-known university town with superb restaurants and street cafes. Numerous wine farms in the region offering wine tasting and delicious lunches, some properties steeped with history. The neighborhood village of Franschhoek is known as the culinary capital of South Africa, deriving its culture from French Huguenot settlers. De Kraal Estate is the ideal accommodation for golfers, having 10 golf courses within 30 minutes drive. Cape Town International Airport are within 40 km. Ponds, a hanging bridge, tennis court, thatch gazebos, paddle boating, bird watching hat and romantic relaxation plateaus characterize the exceptional beauty of this 1. 8 hectare property. We were fortunate enough to get to spend 3 weeks recently at Lemon Tree Cottage. And we can honestly say that there was not a single thing we would want to improve on. 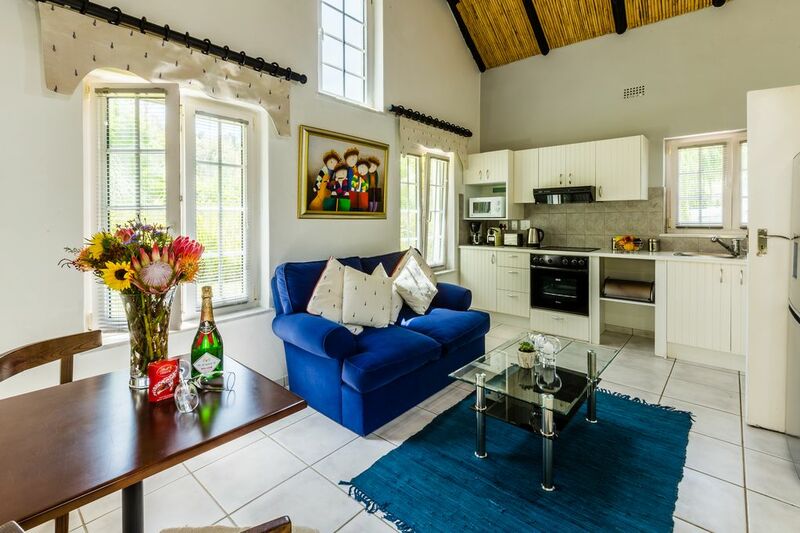 The cottage is located just far enough out of Stellenbosch to feel you are in the country but close enough to be convenient for shopping, restaurants, etc. as well as being close to several amazing wineries / restaurants nearby. But the facilities, the grounds and the on-site staff are what makes for a perfect stay. They have not missed anything in making the cottage seem like home. We will definitely be staying here again anytime we come back to this area. I stayed in Lemon Tree Cottage for three months, and enjoyed the fully equipped accommodation, the beautiful garden, and the stunning location.